1. The Shock of the Fall by Nathan Filer (full review here) This was my first book of the year and not the kind of book I'd usually go for. It's one that is just so well written, it doesn't really matter what the actual story is. It follows the scrambled mindset of Matthew, who suffers with a mental illness, as he attempts to recall how his older brother died when he was a child. It's beautifully written and one I'll remember for a while. 2. The Husbands Secret by Liane Moriarty (full review here) I'd read loads of positive reviews about this book so I was eager to read it but, unfortunately, it didn't live up to the hype for me. Housewife Cecilia accidentally reads a letter from her husband, that she was only supposed to read after his death, which reveals a deep, dark secret with the potential to destroy her own - and others - lives. It was suspenseful and I did want to know just what the bloody secret was but it just didn't grab me as much as I thought it would. 3. No Time For Goodbye by Linwood Barclay (full review here) If you love fast-paced thrillers, then this is one for you. I always like Linwood Barclay novels and this one didn't disappoint. 14 yr old Cynthia wakes up one morning to discover her entire family have disappeared with no explanation. 25 years later, she begins to unravel what really happened to her long lost family. A real page-turner. 4. Daughter by Jane Shemilt (full review here) Woman's daughter goes missing. A year on, she's still trying to find her. Sounds good. But it isn't. Well, it's okay. But the ending just makes you question everything. It still annoys me to this day, lol. 5. The Best Thing That Never Happened To Me by Laura Tait & Jimmy Rice (full review here) This was one of those 'cheesy chick-lit's' I picked up and didn't think I'd really enjoy but I was proved oh so wrong. It's not actually cheesy at all. But it will make you go 'awww'. It's told from the point of view of two best friends who parted ways 10 years ago but end up back in each others lives again. A cute, funny read that won't make you want to be sick. 6. Before We Met by Lucie Whitehouse (full review here) Whilst Hannah's husband is away on a business trip, she starts to become suspicious of his whereabouts when he doesn't return. And no-one else knew he was going in the first place. This book starts off really fast paced but then just slows down completely. The ending is good but it's a case of whether you can be arsed to get there or not, to be honest. 7. Hero or Zero* by Julie Shackman (full review here) I had this book sent to me as an e-book which was a first, for me! This was one of those books where not much happens but it'll make you smile. It follows a ditzy mum who enters a competition to live with a celebrity for a month - and wins! It's light hearted and just really cute. 8. Without You by Saskia Sarginson (full review here) Another thriller - aren't I predictable? But this was probably one of my fave thrillers of the lot. Set in Suffolk, the Gale family are in bits after their oldest daughter Eva is believed to have drowned at sea whilst out sailing with her father. But unbeknownst to the family, she's actually been kept in a concrete hut just a few miles away from their home by a man. The story is told by both Eva - as she's been held captive - and her sister Faith, who's convinced Eva is still alive. 9. The Boy That Never Was by Karen Perry (full review here) Five years ago, following an earthquake in Morocco, Harry and Robin's son is presumed dead - although a body is never found. Fast forward to now and Harry is convinced he's just seen his son in a crowd in Dublin. Was it really his son? I did really like this book and, although I got a bit bored in the middle, it was worth reading til the end as I wasn't expecting what was to come! 10. We Are All Completely Beside Ourselves by Karen Joy Fowler (full review here) I'm still undecided on this book. On one hand, I've never read anything like it. But, on the other, it still baffles me and I'm not sure if I actually liked it. But it's still worth a read because I'm pretty sure you won't have read anything like it either. I can't really say much about this book because there's a twist a couple of chapters in and, if I'd have known the twist before I read it, I would have been disappointed. 11. The Accident by C.L. Taylor (full review here) This book is literally full of suspense. A bit 'hollywood' but still a page-turner, all the same. When Sue's daughter steps in front of a bus and ends up in a coma, she's determined to find out why her daughter would do this and uncovers lots of secrets about her daughter - and herself - along the way. 12. We Were Liars by E. Lockhart I was really excited about this book as I'd heard people compare it to Pretty Little Liars so I was a bit disappointed to find out it wasn't. It basically focuses on four friends - who are all part of different wealthy families who spend their summers on a private island - whose friendship becomes destructive. There's a lot of mystery in this book so I won't say much and I did find myself wanting to know what was going to happen but I just didn't love it. 13. Deep Blue Sea by Tasmina Perry Ah, I do love a good Tasmina Perry novel when I'm on holiday. I read this on my week away in Ibiza (good times) in like a day, I think. I always wizz through Tasmina's books as they're just so good. They're basically murder mysteries meet chick lits. This one focuses on Diana Denver, who is determined to prove that her husband didn't kill himself, so she enlists the help of her journo sis, Rachel. Defs one for the beach. 14. Big Little Lies by Liane Moriarty Another of my holiday reads, and my second by Liane Moriarty. I actually think I preferred this to The Husband's Secret even though that book is much more hyped up. The book follows three Mum's who all have children in the same Kindergarten class and who's lives start to become entwined resulting in lots of scandal and, of course, big little lies. It's not gripping, like some of the other books I read this year, but it's well written and a good book to flick through by the pool. 15. Fractured by Dani Atkins This was the third book I read on my week away in Ibiza and I think this was my favourite. The book starts with a car crash which devastates the lives of a group of friends. Especially Rachel who is the main character. Five years on, she's still struggling with the events of the tragedy but, after a sudden fall, she wakes up in hospital and it appears her life has gone back to how it once was. I loved this book - it's mysterious and grips you right up until the end. Plus, it's pretty short so you'll read it in no time! 16. A Year of Losing the Dating Game* by Samantha Bye (full review here) I had this book sent to me by the lovely Samantha and found it absolutely hilarious. Sam writes about the highs and lows of her experience in the dating game for a whole year. What makes it even better is that it's all true. 17. I Let You Go by Clare Mackintosh Following a tragic hit and run, Jenna packs up her belongings and runs away to the Welsh coast. The book follows her as she copes with the loss of the boy as well as the detectives who are assigned with finding who was guilty for the tragedy. This was my most recently read book and I really enjoyed it. The first half is a bit slow but just stick with it because there's a huge twist halfway through and you won't want to put it down after that. WELL, that took me bloody ages to put this post together so I really hope you've found it helpful and might have possibly found a few books to add to your 'to-read' pile! 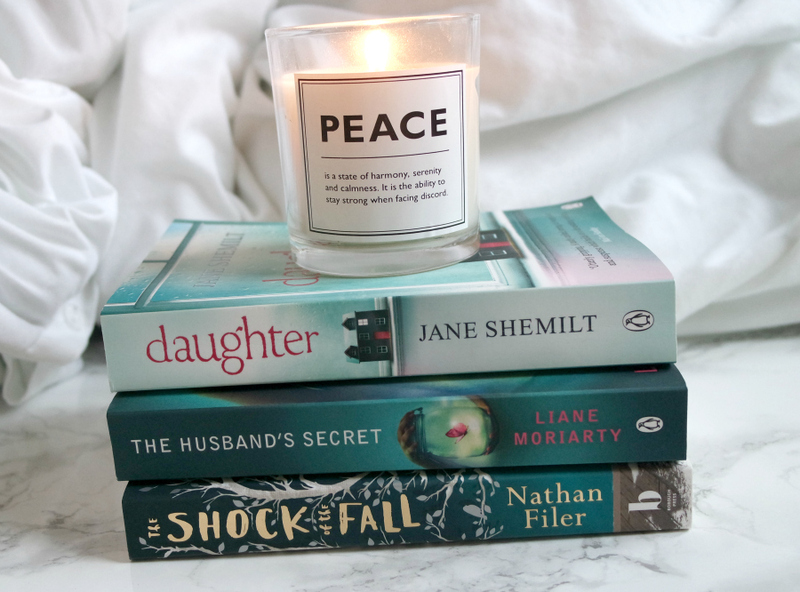 If you're only wanting to read a few, then I would say my top five were probably; I Let You Go by Clare Mackintosh, The Shock of the Fall by Nathan Filer, Without You by Saskia Sarginsson, Fractured by Dani Atkins and No Time For Goodbye by Linwood Barclay. Check out my December advertiser - Misia from Go Wash Your Face!